Iconic fashion designer Zandra Rhodes will reveal the secrets behind her success at the University of Ulster this week. The legendary style guru, famed for her often unconventional style and pink hair, will present a talk on Friday 11 June at the Belfast campus as part of the Ulster Festival of Art and Design. Zandra graduated from the Royal College of Art in 1964 and opened her first clothes shop on the Fulham Road in London just four years later. By 1969 she had issued her first collection – romantic garments with her favourite fabrics of felt and chiffon. She quickly became one of a new wave of British designers who put London at the forefront of the international fashion scene in the 1970s. Her designs are considered clear, creative statements, dramatic but graceful, bold but feminine.Zandra went on to design for Diana, Princess of Wales, and a host of high profile celebrities including Freddie Mercury. Zandra is currently working on several projects including a partnership with the San Francisco Opera, Marks and Spenser and Millets. She has also founded her own Textiles and Fashion Museum in London which displays all of the fabrics and garments that she has used since the beginning of her career. In 2009 she was appointed Chancellor of University for the Creative Arts. 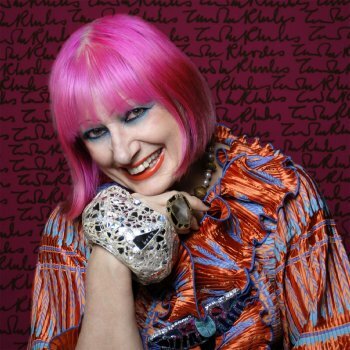 Zandra Rhodes’ talk will take place at 6pm on Friday 11 June at the University of Ulster’s Belfast campus. For further information and tickets contact Kelly Gordon, Cultural Development Office on; 028 90267285 or email: k.gordon@ulster.ac.uk.